Week 5 of the 2014 NFL season begins with the Minnesota Vikings traveling to Green Bay to clash with the Packers on “Thursday Night Football”. If you are running an office pool or a pool with your friends, you will never have to frantically search for pick sheets again. 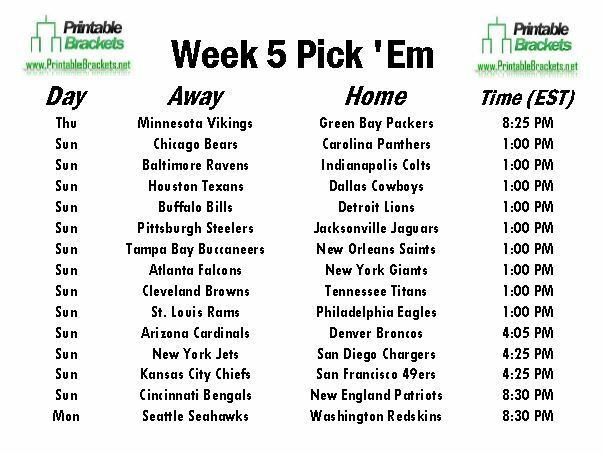 The NFL Pick Em Week 5 sheet is available for instant download for free thanks to Printablebrackets.net. Longtime NFC North rivals will kick off the action on the NFL pick em Week 5 sheet as the Packers will host the Vikings. Green Bay captured the division crown on the final day of the regular season last year with a victory over the Bears. The Vikings are looking to bounce back from finishing a North-worst 5-10-1 in 2013. There are nine early Sunday games on the NFL pick em Week 5 sheet. Early Sunday matchups include the Dallas Cowboys hosting the Houston Texans, the Chicago Bears clashing with the Panthers in Carolina, the Atlanta Falcons facing the New York Giants, and the St. Louis Rams squaring off with the Philadelphia Eagles. The late Sunday action on the NFL pick em Week 5 sheet is headlined by a meeting between the Kansas City Chiefs and San Francisco 49ers. Former quarterback Alex Smith will be making his first return to San Francisco in a Chiefs uniform. The final Sunday affair on the NFL pick em Week 5 sheet features the Cincinnati Bengals against the New England Patriots on “Sunday Night Football”. Week 5 wraps up with the defending Super Bowl champion Seattle Seahawks locking horns with Robert Griffin III and the Washington Redskins on “Monday Night Football”. A total of two teams will enjoy their bye week in Week 5. The Oakland Raiders and Miami Dolphins both have the week off.